Let me share why this is just a silly comparison . . . The typical Wi-Fi enabled American home has 1 access point. OSU currently has more than 8,300 access points. Most homes have a few laptops, phones, a tablet or two, a smart TV, and maybe even a Wi-Fi enabled toaster. So, lets say an average of 10 devices simultaneously using Wi-Fi. OSU simultaneously services more than 41,000 devices. Wait . . . I have more! 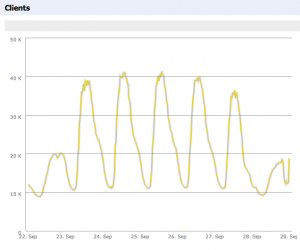 Looking at just our secure “osuwireless” network, we serviced over 200,000 unique devices in a single week! 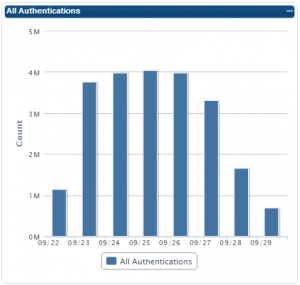 And in the same week, we saw over 4 million authentications a day! So, does size matter? Well, when it comes to designing and supporting Wi-Fi networks, “yes”. You can understand that with a network of this size, there are inherent complexities. The biggest challenge engineers like myself have is to eliminate as much complexity and provide as simple and secure of a network as possible. We want the service to function and be as easy to use as the Wi-Fi network in your home. Because at the end of the day, users do not (and should not) care about the inner-workings of the network. The thing just better work! We knew it was coming. In fact, emails were being exchanged, bracing ourselves for what was about to occur. Then, sure enough, 1:00pm struck and “the Internet stopped working” . . . at least that’s what I overheard others in the building claiming. What happened? Unless you live in a cave, you’re aware that Apple released iOS 7 for their mobile devices yesterday. Certainly the owners of the 51,000+ iOS devices on campus knew this. The moment it was released, the amount of traffic leaving the university (bound for the Internet) increased significantly. After the first 15 minute burst, we began to think that was the worst of it. Then 3:45pm came and boom! EVERYONE wanted the latest Apple goodness. In order to show you how this looks from our perspective, let me give you a baseline. As of this post, the university has roughly 5Gbps of Internet bandwidth from our provider, OARnet. You can see a week ago on last Wednesday, utilization plateaus right around this cap. Fast forward a week and you can easily see just how much of an impact Apple’s software release had on campus. Clear as day, right? To be clear, the Internet did not “break”. There was just massive contention for the shared amount of bandwidth we have at the university. The same thing occurred last year with iOS 6, and similar events occurred during last year’s BigTen basketball tournament. It’s no different than everyone jumping onto I-71 at the beginning of a holiday weekend; there’s only so much room on the road. Growth is constant. We know this. Just look at the world population! This is no different when it comes to adoption of technology and use of network resources. Every autumn quarter — er, semester (still not used to that) — we see an expected jump in users on the campus wireless network. More students are bringing more devices and are connecting to the ever increasing number of Wi-Fi access points we deploy. It is shocking, however, just how many there are. Let’s take a look. Going from Autumn 2011 to Autumn 2012, I admit: we were caught off guard. We saw an increase from about 17,000 devices to 27,000 devices – a 59% increase! This was the first fall term after the iPad was released to the public and the tablet rush began. So, our assessment was that this increase, while monstrous, was an outlier. In previous years, we had seen roughly 15% increases. Going forward, we would be aware of such bursts in Wi-Fi usage while also being cognizant that this increase was not inline with previous trends. Like all summers, we made preparations for fall. In addition to adding IP address space, we also combined the academic and residence hall infrastructure and resources so they could be shared and accommodate both daytime and evening peak usage periods. We were prepared! The amount of growth was once again astounding, now seeing 42,000 devices . . . a 53% increase! With these two consecutive years of unprecedented growth, we have to assume similar growth year after year going forward. This means next year, we could be expecting upwards of ~75,000 devices! Matthew DeVore on Try harder, scammers! holland.112@osu.edu on Does size matter? yun.112@osu.edu on Does size matter? Derek on Try harder, scammers! Anthony on Try harder, scammers!